Home / astronomy / natural hazards / saros series / science / solar system / space / technology / technology articles / types of eclipses / Why do eclipses happen and how many different types of eclipses are there? Why do eclipses happen and how many different types of eclipses are there? Why do eclipses happen? And how many different types of eclipses are there? Eclipse is an astronomical phenomenon of great magnificence, beauty, and prestige, as long as it relates to several things and myths in ancient religions to the intensity of people's attachment to this scene. The phenomenon of the lunar eclipse is an astronomical phenomenon that occupied the minds of scientists and philosophers since ancient times. The stories and popular myths about a wicked wolf trying to swallow the moon, people come out loud to help the moon and save it. This is due to the intensity of human attachment to the moon and the benefit of its dim light, which illuminates the darkness of the night. But after the dawn of modern science, scientists began to understand this beautiful phenomenon, and benefited in much important cosmic research and to determine the course of the planet and movement, and the shape of the ball before the invention of satellites. Learn more about this phenomenon and why it occurs. What does the lunar eclipse mean? As we all know, the moon is a dark object, which picks up its light from the sun and reflects it on the ground to illuminate it at night. Lunar eclipses occur when the earth blocks the sun from the moon. That is when the earth stands between the sun and the moon in a state called "planetary coupling". The eclipse varies whether the pairing is full or partial, ie the three are in a completely straight line or at an angle. 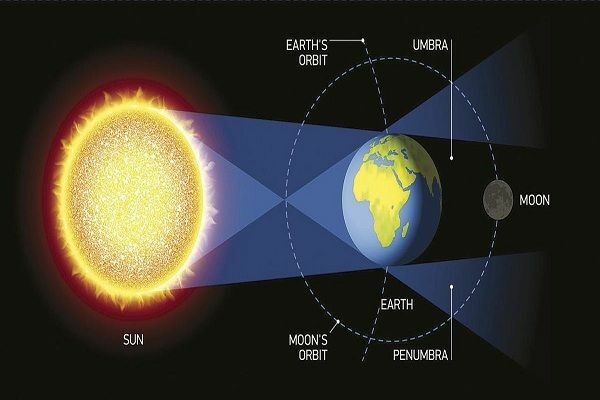 The lunar eclipse, as we mentioned, is to block the sun from the moon by the Earth, but the solar eclipse means blocking the sun from the Earth by the moon. It is a combination of another kind so that the moon is in a straight line with the earth and the sun is in the middle. The sun shines from the earth and maybe a complete eclipse of the rays, partial or annular. The phenomenon occurs in the middle of the lunar month, such as the Hijri months whose calendar depends on the movement of the moon. It occurs only twice a year, not all regions of the world can see eclipses and only areas where the moon is above the horizon. The earth is a shadow region behind it as it rotates around the sun, and because of the shape of the spherical earth, the shadow is shaped like a cone. When the moon wraps around the earth it will enter the shadow area during its rotation. He first begins to enter the "semi-shadow" area, and the light begins to fade because of the lack of sunlight. This area is called a "partial external shadow" or "penumbra". Then it begins to enter the "shadow of the earth" area, the earth will completely wipe the sun from the moon and enter the state of eclipses. This area is called "shadow swindler" or "umbra". When he passes through the shadow, he returns to his light and the eclipse ends. The eclipse lasts about an hour and a half to complete the above steps and pass through the shadow of the earth. This type occurs when the moon passes through the Earth's shadow region completely. The earth is completely obscured by the sun from the moon, and the moon's light disappears from the earth's sky and loses sight. Meanwhile, on the moon, the temperature falls rapidly in the duration of the eclipse. They are naturally up to 130 ° C, while during an eclipse it is below 99 ° C. A temperature may change of 229 ° C in just an hour and a half. This eclipse occurs when a part of the moon passes through the area of the Earth's shadow only and not all. The light of this part disappears as if the earth is printing its shadow on the moon for a limited time. It is not an eclipse in the sense of the word, but moonlight only because of the lack of sunlight that reaches it. It is actually a visual trick rather than a phenomenon. Where you can see the sun and the moon at the same time, but at opposite points and appear higher than their original location. This kind of eclipse occurs due to the refraction of light falling on the Earth on the atmosphere. It is not a scientific term; it is close to the technical term. This is called when a completely distorted moon appears in the sky on earth. This is due to the low spectrum of the red sun in the Earth's atmosphere, i.e., the spectrum with a long wavelength. Thus, increasing and spreading the blue spectrum with a small wavelength. Atmospheric pollutants also influence the amount of sunlight passing through the Earth's atmosphere. Why does not lunar eclipse occur every month? The moon was associated with the memories of some people in their mind, in which the war would be bloody night or somewhere else in the world, and the death of many brave warriors. As long as the earth revolves around the sun and the moon circulates around the Earth, why does not this pairing happen every month at a certain point? The answer enables the rotation of the earth and the moon around the sun. The orbit of the moon tilts at an angle of five degrees from the earth's rotation around the sun. In other words, the Moon's orbit does not fall on the same level as Earth's orbit. In this way, a lunar eclipse occurs only at the intersection of these two levels, called "the two nodes". The sun passes through this point twice a year only and a lunar eclipse occurs. The sun remains in the region of the two nodes for a month, during which eclipse and eclipse occur. Therefore, you find that any eclipse followed by eclipse half a month before or after, as well as an eclipse may be followed by eclipse before or after. Just as an eclipse was observed in the Arab and African world on 7 August 2017, followed by an eclipse that was observed in North America on 21 August 2017. The partial lunar eclipse occurred on August 7/8, 2017, which was the second of two lunar eclipses in 2017. The moon was covered slightly by the ecliptic shadow of the Earth on the maximum eclipse. Inside the umbilical shade, the moon was a subtle red, but in the outer penumbral shade, it is difficult to see the contrast of the very bright moon. The Solar Eclipse of August 21, 2017, happened fourteen days later in the same eclipse session. This was the first total solar eclipse in the United States after the solar eclipse of February 26, 1979. On the evening of Monday of this seventh of August, corresponding to the middle of the month a partial eclipse of the moon was observed and monitored by astrological devices. It started at 20:23 and ended at 22:18, nearly two hours longer than the usual average of eclipses. It has been seen in our Arab world, and in Africa, Asia, Australia and parts of Eastern Europe. Saros is a period of approximately 223 synodic months that can be used to predict the eclipse of the Sun and Moon. After the eclipse, a saros period, Sun, Earth, and Moon return to almost identical relative geometry, a straight line, and almost identical eclipse, which is known as the eclipse cycle? One sar is half a saros. A chain of eclipse separately from a saros is called the Saros series. Is a cycle of the three celestial bodies "the sun, the moon, and the earth". It was discovered by the Chaldeans or Babylonians long before the centuries of the Gregorian calendar or modern science. This course was known as Heparchos, Pliny, and Ptolemy, before the name Saros. A cycle used to predict the occurrence of eclipses and eclipses throughout the world. At that session, the three objects move in the same way and return to their original point at the end. The same phenomena of eclipses and eclipses occur around the world during the course, but with a slight difference in meridians due to the extra eight hours in the cycle. We conclude from this course that the same phenomena of eclipse and eclipse will occur in the same way and regions every 54 years, enough for the individual lucky to see the same phenomena twice in his life. In the end, the beauty and splendor of the lunar eclipse remain which indicates the ability and beauty of the Creator and his creativity and the system of the motion of planets and celestial bodies through which the closest lunar eclipses can be predicted.